Smart Material offers engineering services for modeling, development, production, and testing of vibration energy harvesting devices based on the MFC product line. Harvesting energy from environmental vibrations has seen an increasing interest during the past years as part of the generally heightened awareness in alternative energy sources. Next to the typical electro mechanical methods, ferro electric devices have proven to be very effective in harvesting energy for low power devices that are often found in portable electronics, sensor-controlled and condition monitoring systems due to the wide usable frequency range and adaptability. The MFC overcomes several disadvantages that arise when using bulk piezo ceramic in vibration energy harvesters. The MFC's robustness and reliability increases service lifetime to more than 20 years, and its flexibility allows easy adaptation to various structures. Bonding the MFC to any structure and form allows for the design of non-resonant harvesters, which opens many new applications. 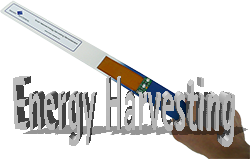 Smart Material is actively involved in the research and development of vibration energy harvesters and is actively presenting its research and results at many of the leading conferences dedicated to the growing increase in energy harvesting applications. You will find additional publications and some of our recent conference presentations under the Publication section on our website. We also offer Energy Harvesting evaluations kits and electric conditioning units as products, including MFCs attached to cantilevers for rapid prototyping.